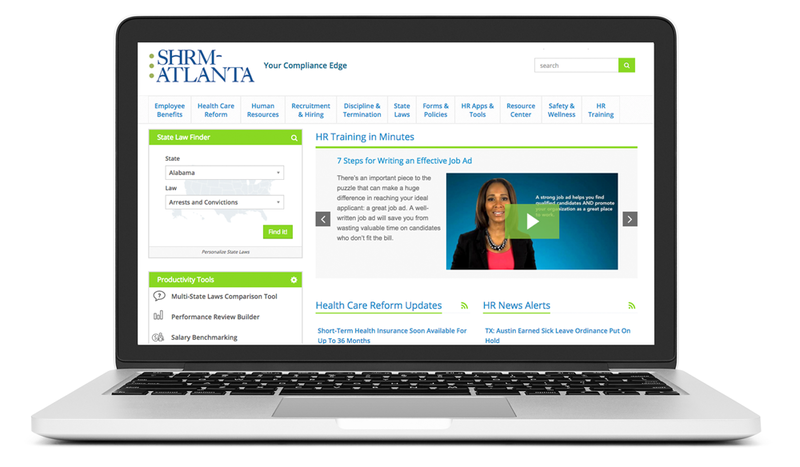 SHRM-Atlanta's HR Compliance Center (hosted by HR360) is an award-winning online library that delivers comprehensive, easy-to-navigate human resources and benefits news, content, tools, and forms. The HR Compliance Center features dynamic interactive HR tools, such as a job description builder and a salary benchmarking tool. You’ll also find easy, step-by-step guidance on how to comply with major laws--including ACA, COBRA, and FMLA--as well as key HR functions, such as hiring and terminating employees. Whether you have five employees or 500, our comprehensive, easy-to-use site makes it easy to stay compliant. SHRM-Atlanta membership includes complimentary access to the HR Compliance Center (a value of $350)! Click here to watch a video and learn what the HR Compliance Center can do for you! ✔ Already have an account? Click here to login. ✔ Don't have an account? Enter your information below to subscribe!